Michael Gibbs, who published an anthology of blank books entitled All Or Nothing, points out that going to all the trouble of producing these workless works “testifies to a faith in the ineffable”. There is beauty in nothing – silence, blank page or canvas – but in turning this into an artistic statement some framing is required, a voicing of the concept: hey, look, it’s blank! Gibbs’ anthology had a cover, a title, and a mission. 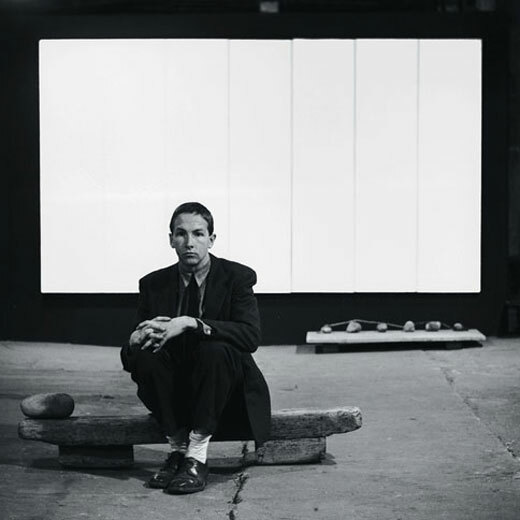 The image we’ve used to illustrate this blog of Robert Rauschenberg with his White Painting – its wall of white canvasses put into context for the photo with sullen artist, raw wood, carefully placed smooth stones… in both cases, the essence of nothing is tainted. The blank page is all around us, every day, without framing, without signposting of context, and we largely ignore it. Perhaps we cannot see it. Perhaps we don’t want to see it. Yes, context is all (as Atwood may have mentioned at some point). Contextualising context is the basic requirement.